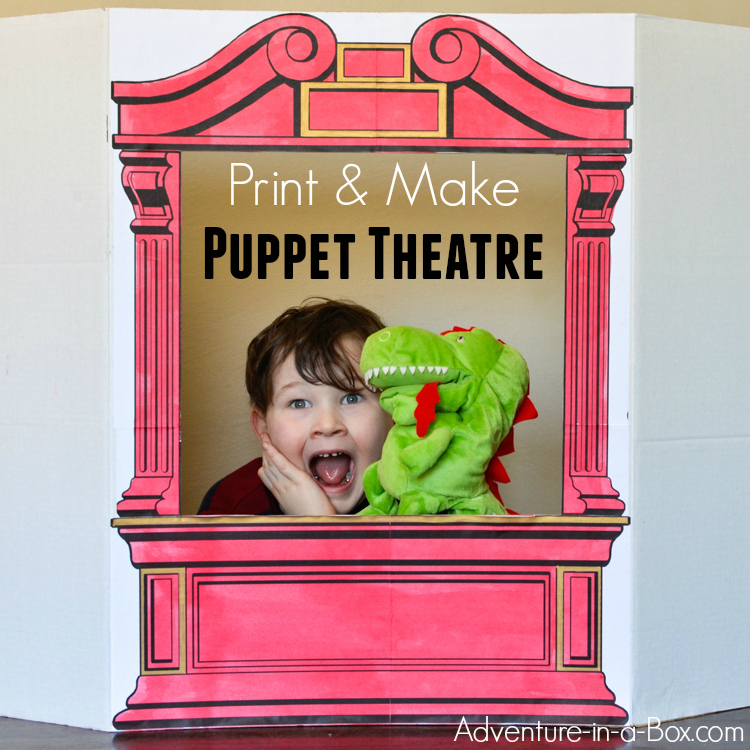 Want to open a puppet theatre at home or in classroom? 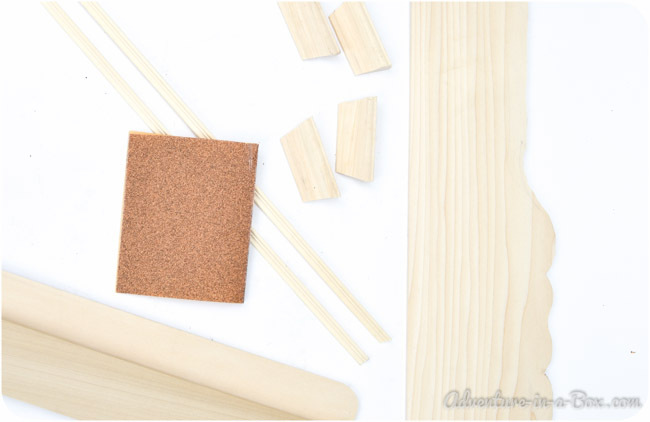 Here is our DIY tutorial on how to build a sturdy puppet theatre from wood! And if you’re looking for a simple and quick solution for building a puppet theatre, check our printable puppet theatre design. When I was a kid, I found the extract of a novel in an old magazine. Four sisters, all in their teens, were rehearsing a play as they planned to put a home performance for their friends on Christmas. One of them had written the play, and together they had made costumes and decorations. They were having a tremendous fun. Here the extract ended, and I was never able to find the subsequent edition of the magazine. Some of you will recognize the beginning of Little Women by Louise May Alcott. I read the book later, but for years I had nothing but this chapter from a magazine to pour over. It captivated my imagination because I liked writing stories, playing pretend games and participating in performances at school. Alas, I did not have any sisters. When I met my husband and we started talking about children, we always dreamt of a long list of things we will do together. Camp in the backyard, build snowmen in the winter and tree houses in the summer, have treasure hunts with maps and real pirate chests… At some point I would always add, “And we will have a home theatre!” The picture of the March sisters would loom brightly in my mind at that moment. That’s why as soon as our son turned one, I decided that we cannot wait anymore, and it is time to get a theatre. A puppet theatre. 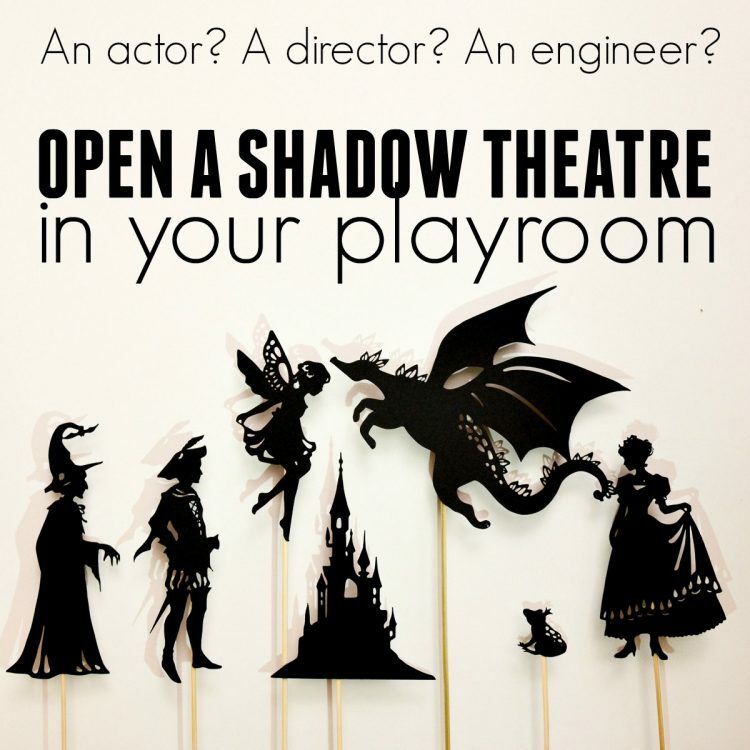 UPDATE: Four years later, our wooden puppet theatre is still with us, but we also made a printable version to share our enthusiasm for puppetry with parents and teachers who are looking for a quick solution. You just print the designs and glue them on cardboard. It is a black and white design, so the kids can have fun colouring and decorating it any way they want. Depending on the age of children, they can either enjoy the shows, stage them, or both. With a parent as a director, show time can start as early as the first year. Research shows that contrasting images attract most attention from infants, and shadow puppets make beautiful black silhouettes against the white background. There is also light involved, which always attracts babies’ attention. Shadow puppets are very stimulating for the visual sense in the first year. As soon as your toddler shows interest in books, his favourite stories can be staged – either with shadow puppets or fabric glove puppets. Gruffalo? Mitten? Bear Snores On? There are a lot of books that have a simple enough story-line. Folk tales make good puppet shows. 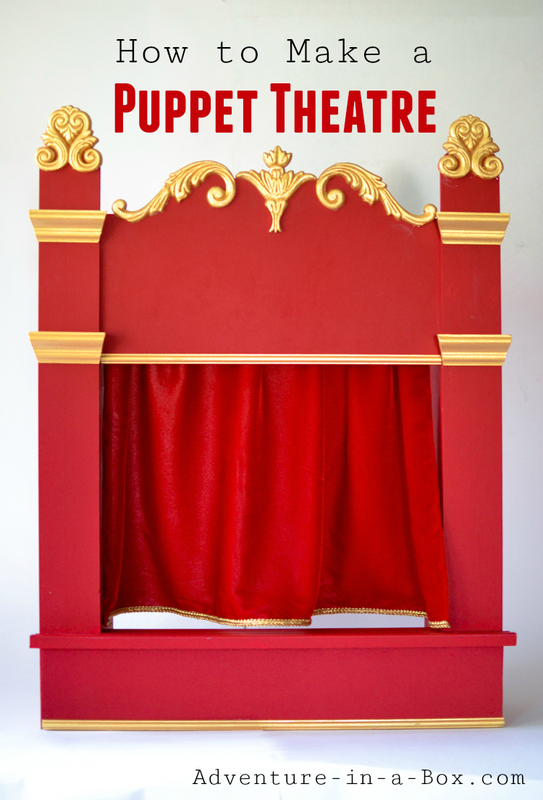 A puppet theatre can become a powerful tool in the development of early literacy. 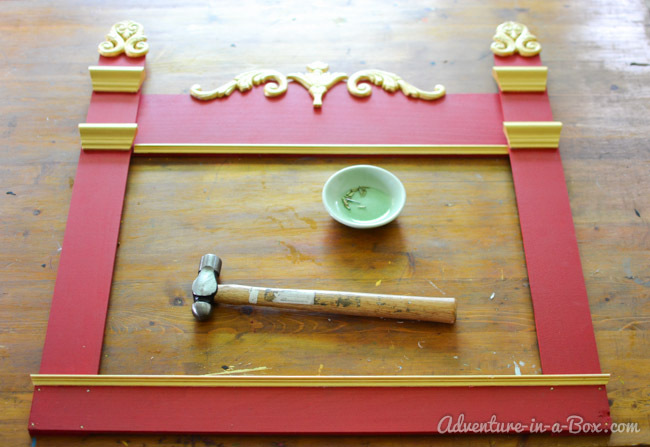 When the thought of making a puppet theatre first came into my head, I was staring at the empty box from a baby gate. It was big, but rather flat. Cut a rectangle in it, stretch some parchment paper across the opening, and you will get a shadow theatre. Do not stretch anything, and it will be a regular puppet theatre. I could paint it, and it would look lovely! On a second thought, if I did the same with a piece of plywood, it would only take a little longer, and the theatre would be sturdier. Decided! Plywood it is. I shared the idea with my husband, and he agreed to help me. It was too late to start a new project that day, but not too late to search for inspiration. So we looked for different puppet theatres. Among many we found one image of a theatre that looked very old and rather dirty, but showed the unmistakable signs of past elegance. It had a plate with the word “Guignol” on it. 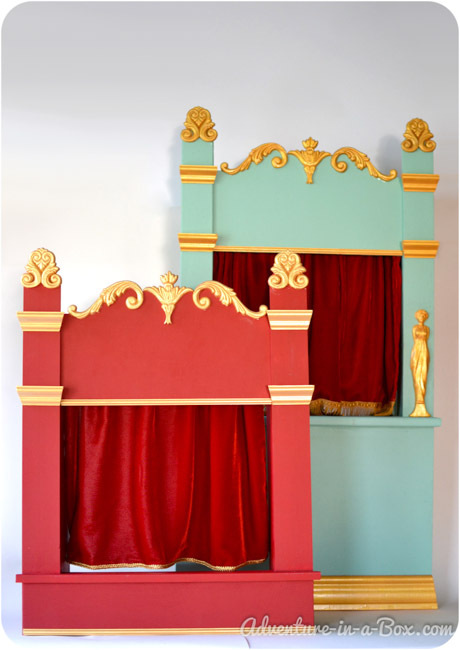 A bit of research showed that it came from a series of puppet theatres, made in France in the 19th century. Some of them could still be found at the auctions, and some in museums. I remember reading a story of one woman who came across a “Guignol” theatre at a flee market. The picture of another “Guignol” theatre came from Russia: it belonged to the last royal family before being acquired by a museum. We decided to model our puppet theatre on a “Guignol” theatre. The characteristic feature of this vintage theatre was minty-green colour with gold accents. Most of them also had the same proportions. At first, I was not sure about how much I liked the minty-green colour, but as we worked on it and I kept referring to the same pictures, I found it growing on me until I was so fond of it I could not imagine my theatre looking differently. It reminded me of the old buildings of Saint Petersburg. 1. Cut all the boards to the right size. After they are cut, you can see the frame we are working towards. 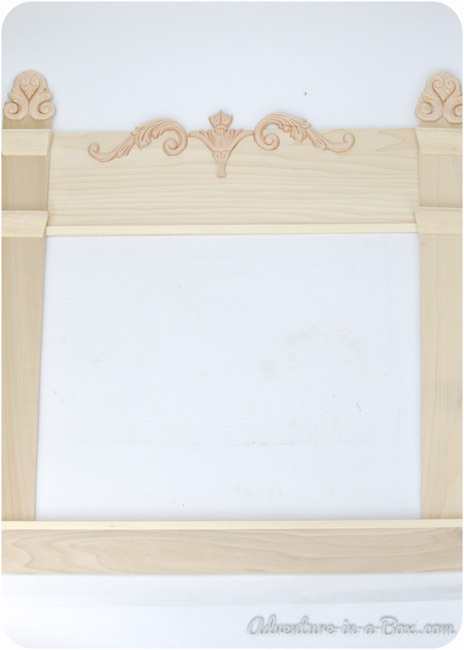 The frame is constructed of light 1/4″ boards. 2. Cut the thin baseboard trim. 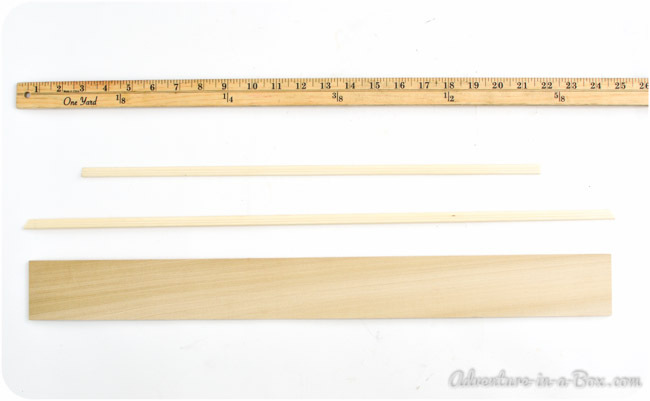 You will need to get two pieces: one should be the same length of your other boards (2′), and the other should be equal the length of the boards minus the width of two boards (1.5′). 3. Cut the thick baseboard trim. 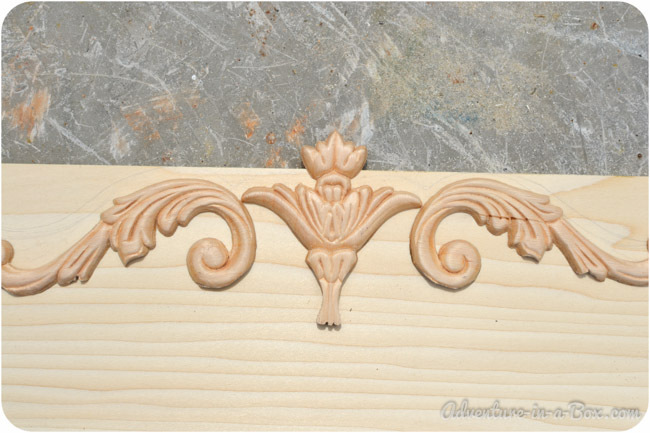 These piece will mark the tops of columns, so they should have the same width as your boards (3″). 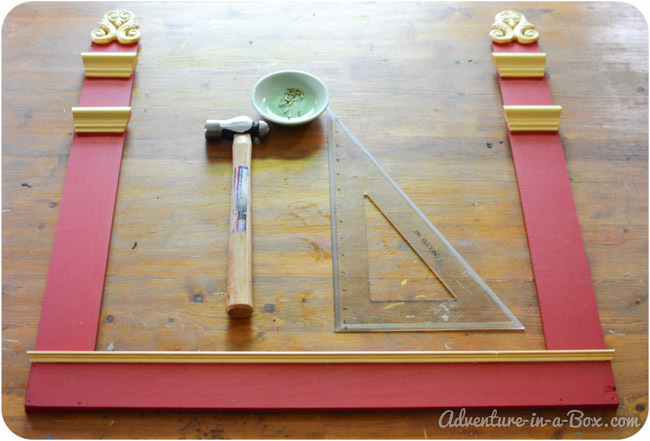 Make an angle template to mark the angles and cut four pieces. Assemble the frame again to check if all the parts fit. 4. 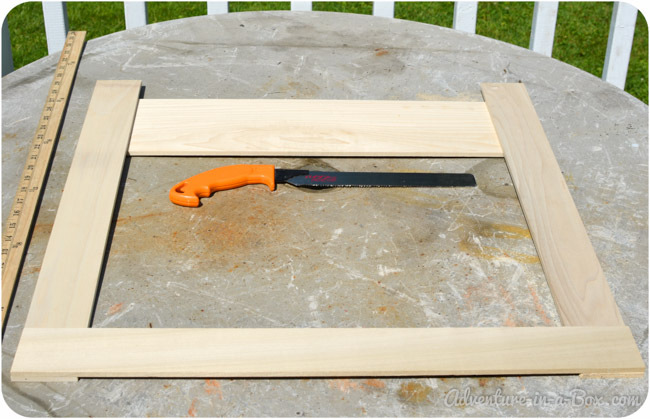 For supporting the frame, you will use a 1″ thick board. 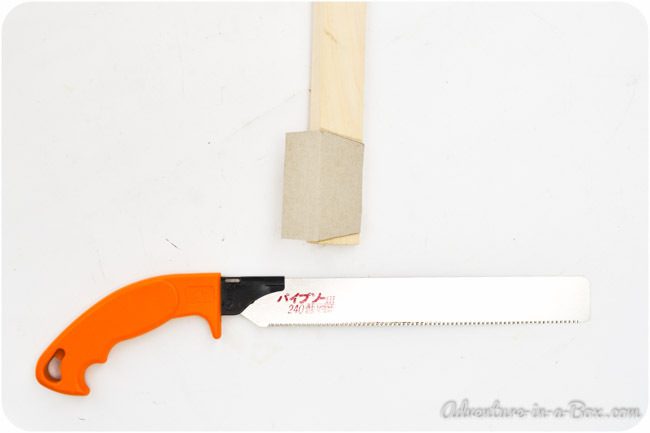 Cut a couple of 90-degree triangles with the longer side being around 7-8″. 5. 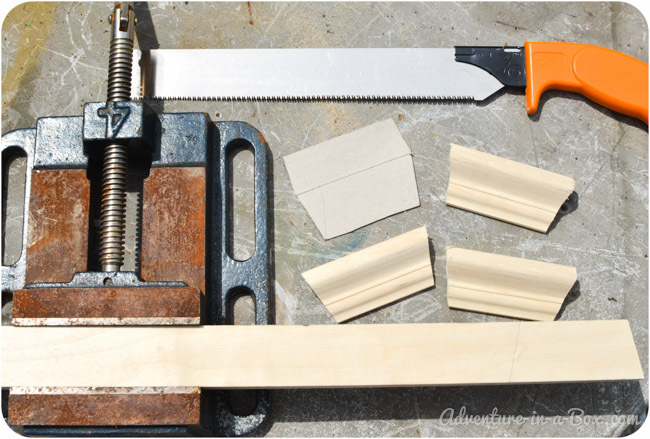 (Optional) If you have a frame saw, or something similar, you can cut the tops of the columns and the top piece to the shape of your mouldings. 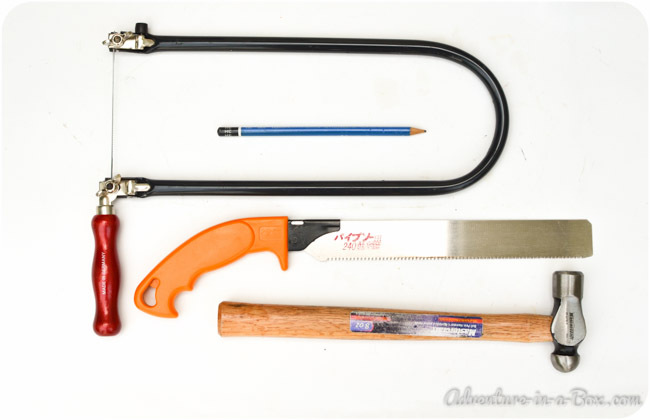 However, if you do not have a frame saw, this step can be skipped – it is an aesthetic step. We are going to cut a decorative edge, so we are outlining the decorations. 6. Sand all the cuts. 7. 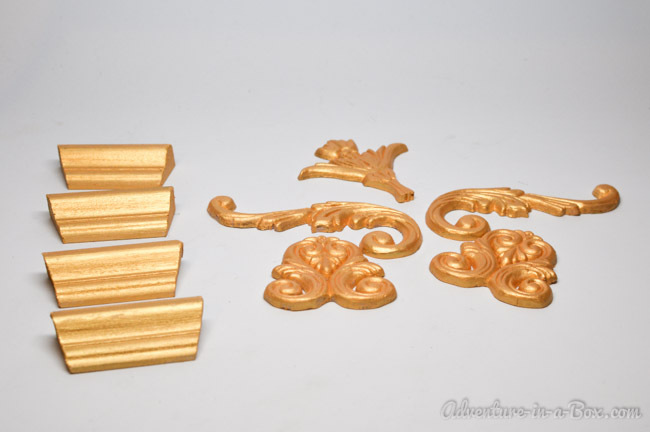 Paint the decorations (wooden mouldings and baseboard mouldings) w ith an accent paint. In our case, it is a golden acrylic paint. 8. Varnish the decorations. It will add additional gloss to the parts. 9. Paint the other parts of the theatre. Do it at least twice. A roller is preferable for this job. 10. 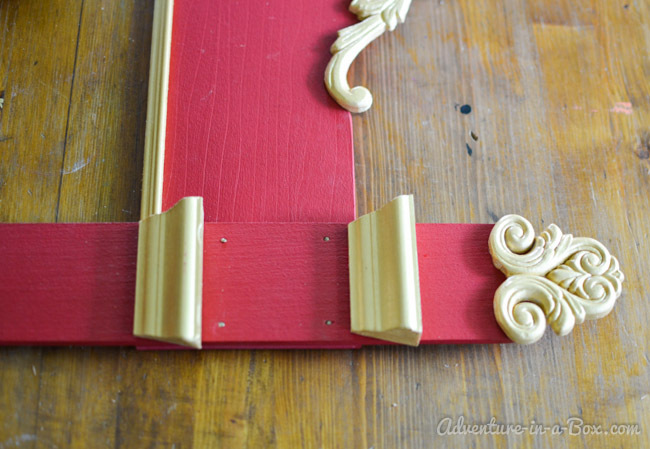 Attach the decorative trim to the structural boards. 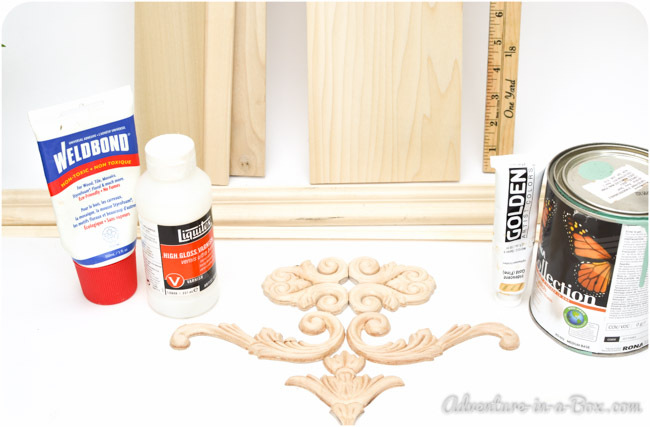 We do it with 5-minute epoxy glue, but other variants are possible. We tried it with a hot glue at first, but it did not hold well. 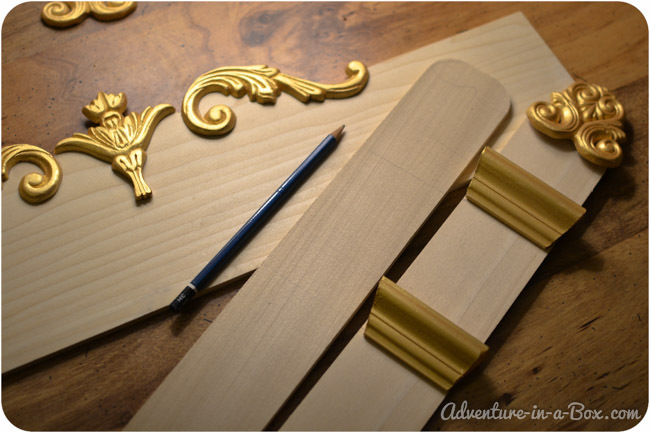 If you leave parts of the boards unpainted, you can also attach the decorative trim to them with wood glue. It holds well. 11. Start assembling the theatre. 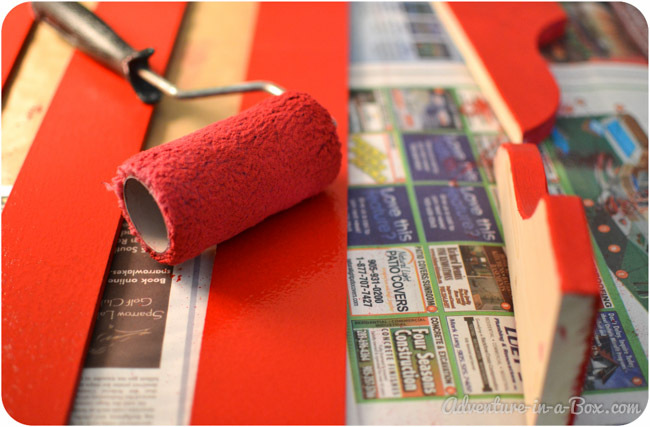 Use both nails and glue for extra sturdiness. First, attach the bottom part to the columns. Then nail the front part to the columns as well. Last, attach the support stands to the back. 12. (Optional) Sink the nails and use wood filler on the holes. 13. Touch up the nail heads with a bit of paint. The theatre is ready! 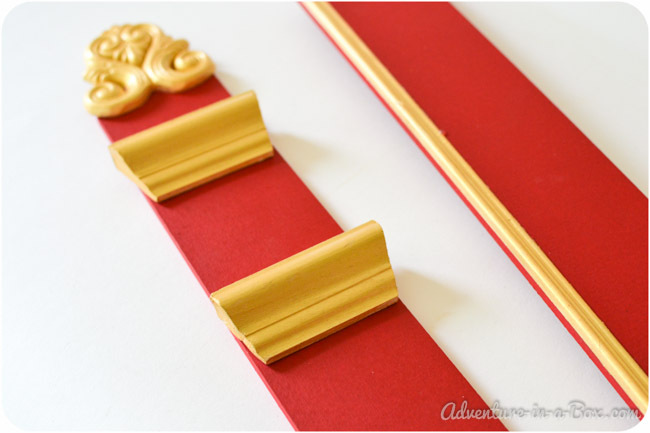 If you want to turn it into a shadow theatre, get a big sheet of vellum paper from a craft or art store and stretch it tightly across the back, securing the ends with pins. You might also want to add a curtain to your theatre for the additional theatrical effect. If your family enjoys home performances, designing posters for plays and making tickets would also add more fun to this activity.